Most - but on ALL - objects that are relevant sparkle. Some items can be added to the inventory at the bottom on the screen. Click an inventory item and then the desired hotspot on screen to use it. 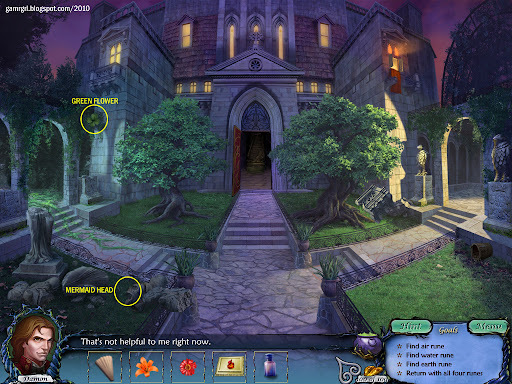 Click the HINT button at bottom right for clues to the next step. For inventory puzzles, Damon / Victoria hints at the next action. 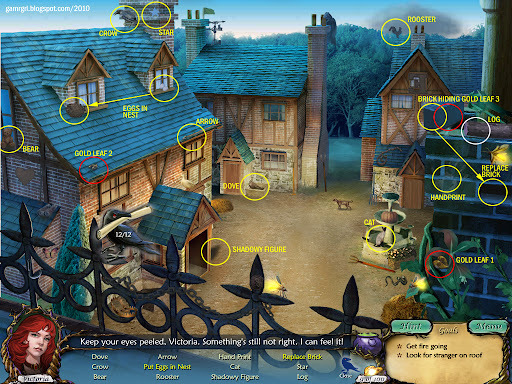 For hidden objects, a flashing circle highlights an object at random. Gold leaves are hidden onscreen. Some screens have more than one. 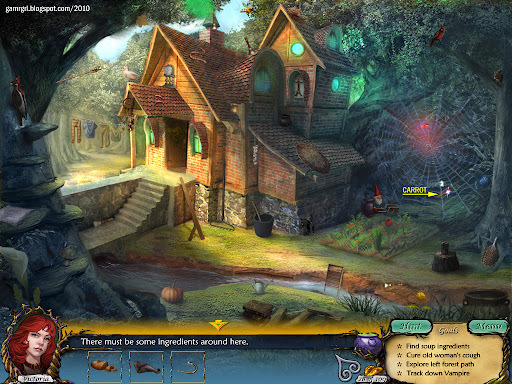 The gold leaf counter at bottom right flashes when the scene has more leaves to be found. 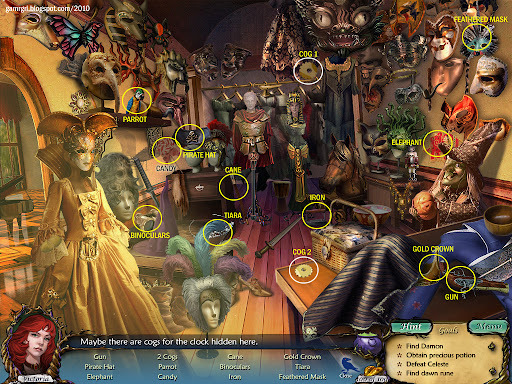 Hidden objects except useful items are random, and my lists are only representative. 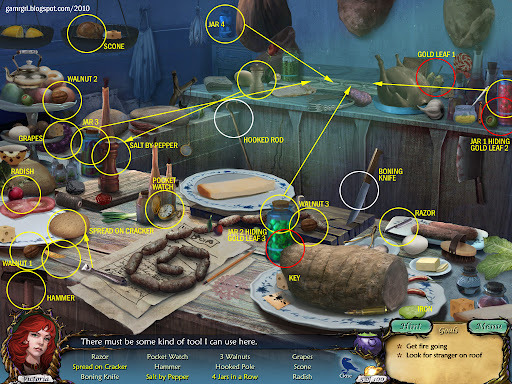 Hidden objects listed in yellow require interaction with another - click the first listed object, the click the second listed object to complete the interaction. Hidden objects listed in blue have to be found / used in a specific order. 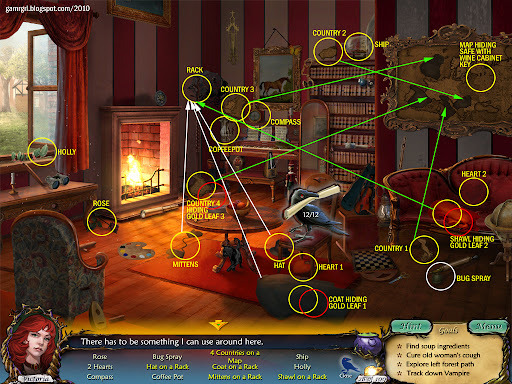 Clicking too many hidden objects randomly makes the cursor spin out of control for a few seconds. 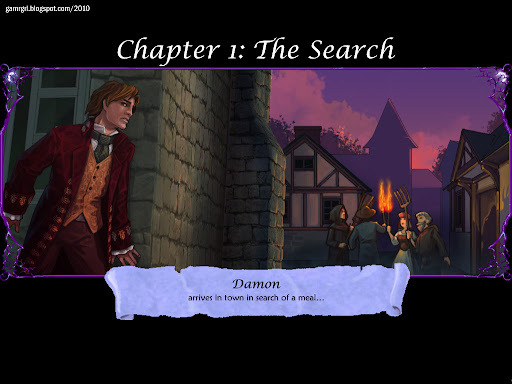 Damon is in the village on quest for fresh blood, but the villagers are panicked about the Vampire Witch in the forest beyond their village. Damon has to stay out of sight till he determines which villager he can kidnap for him and Celeste to feast on. 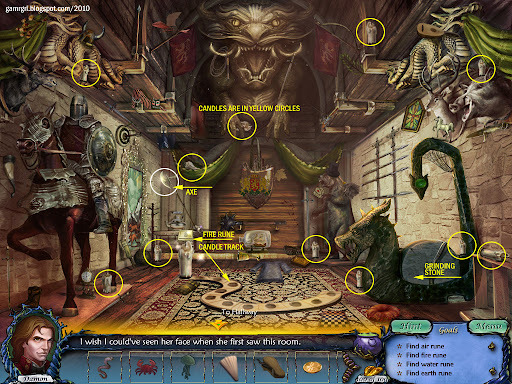 Click here for the screenshot of the room. Damon has to shut the shutters. Click the two shutters on the window at left, one after the other. Damon has to find a villager to feast on. Damon has to exit the kitchen. Click the door on the right wall. It's locked. Damon has to unlock the door. Click the crowbar on the floor in front of the door. The crowbar is added to the inventory. Click the loose floorboard in front of the kitchen counter. There is a blood drop hidden underneath. Note the blood counter on the door. Damon needs 5 blood drops to able to pry the door open. Click the blood drop in the middle of the kichen counter. 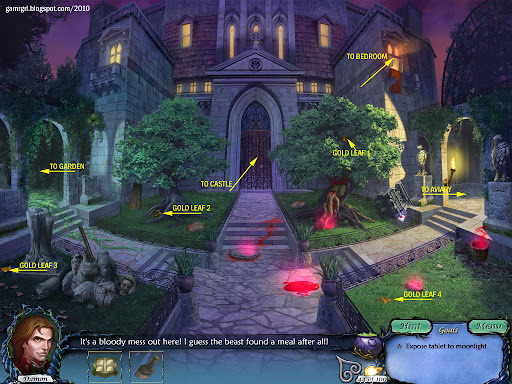 Click the blood drop in the dish on the shelf behind the counter. Click the cupboard below the window. Take the blood drop inside. 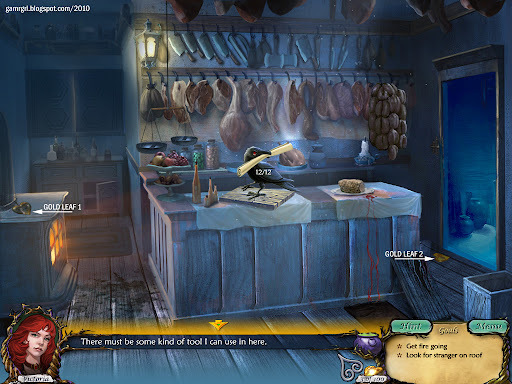 Take the meat hook, bone and bloody meat from the counter. INVENTORY: Click the meat hook. Click the empty space on the wall between hanging meat pieces. INVENTORY: Click the bloody meat. Click the empty meat hook. Click the blood drop in the pan. All 5 drops are ready. Exit to the storage room. Take the gold leaf from the centre of the floor. Damon must collect a 100 leaves to get a vision. 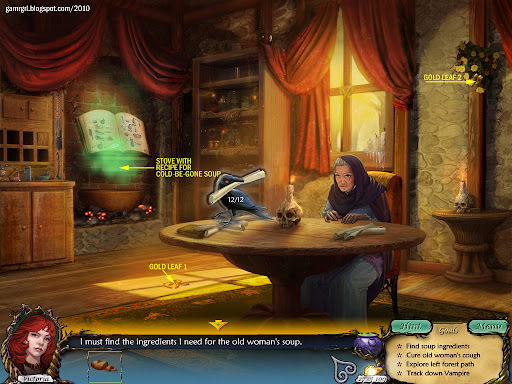 Take the gold leaf from the large pot at the right of the wine cabinet. Damon has to open the trapdoor / ceiling hatch to get to the roof. Click the locked trapdoor neat the roof. 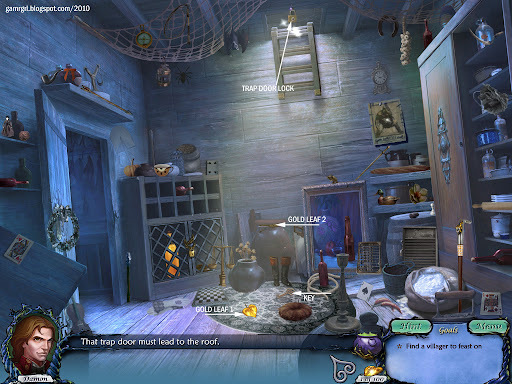 A raven flies in with a list of hidden objects. 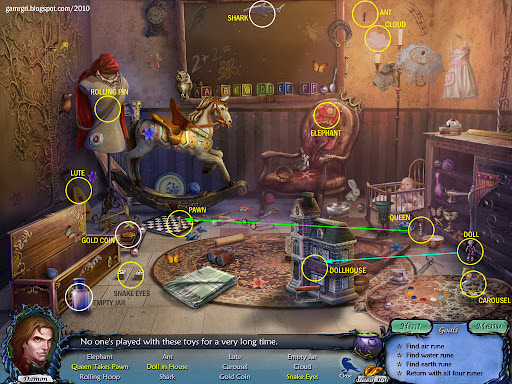 Click here for the screenshot of the objects. The key is added to the inventory. Click the lock above the trapdoor. Damon flies out of the room. Take the gold leaf on the bottom edge of the roof. SOLUTION: Damon has to get to the green square at the top right of the roof by stepping on the mossy green or intact white tiles. Being a vampire, he cannot step on tiles with crosses, while broken red tiles will not support his weight. Click here for the screenshot of the solution. 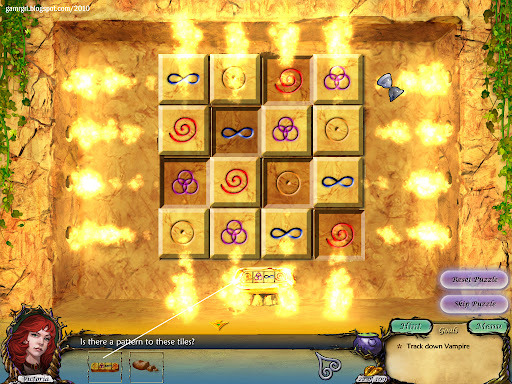 Click here for the screenshot of the square. Damon has to identify a mortal to feast on. Click the crowd at the rear left to reveal Victoria. Click on Victoria for a close-up. The Mayor's niece Victoria is anxious to discover the evil that's plaguing their town, and notices a stranger - Damon - lurking on the nearby rooftop. She sets out to investigate. Click on Damon on the rooftop at top left. 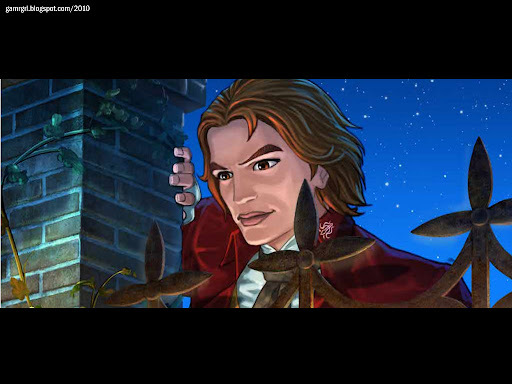 Victoria wants to find out who the mysterious stranger on the roof is. But first, she has to go home. Take the twigs on the ground at right. Take the gold leaf from the ground at the left of the door at right. Take the gold leaf above the eave of the door at right. Enter the house at right, the Mayor and Victoria's home. Victoria has to revive the embers in the fireplace. Take the crumpled paper from the left of the fireplace. Take the bellows from the right of the fireplace. INVENTORY: Click the crumpled paper. Victoria needs a branch as firewood. Enter the butcher shop - the door at the rear. Go through the door at right to the storage room. Victoria has to find a way to lower the ladder. Return to the butcher shop. Take the gold leaf above the fireplace at left. Take the gold leaf at the foot of the door at right. 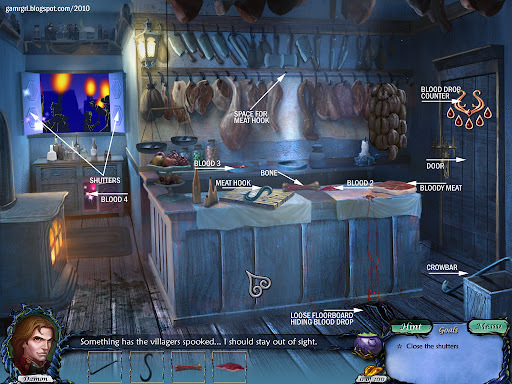 Click the raven to get the list of hidden objects to be found on the counter of the butcher shop. Click the knife at the bottom left. Click the round cracker just above it. Click the salk shaker on the left, rear counter. Click the pepper shaker on the left, front counter. Click jar 1, extreme right, rear counter. Click the jar tray / stand, middle, rear counter. Jar 2, center, front counter. Jar 3, left of pepper shaker, front counter. Jar 4, blue, rear left cabinet. Take the gold leaf exposed by jar 1, rear counter. Take the gold leaf behind the chicken on the rear counter. Take the gold leaf exposed by jar 2, front counter. Go right to the storage room. INVENTORY: Click the hooked pole. Click the lowered ladder to climb to the roof. SOLUTION: Victoria has to get to the crossed square at the top right of the roof by stepping on the crossed or intact white tiles. She cannot step on the slippery mossy tiles. The broken red tiles will not support her weight. 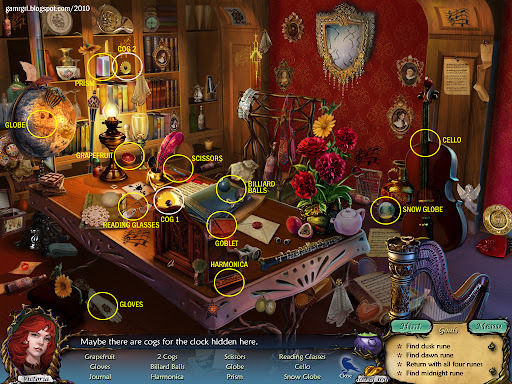 Click the raven to get the list of hidden objects. 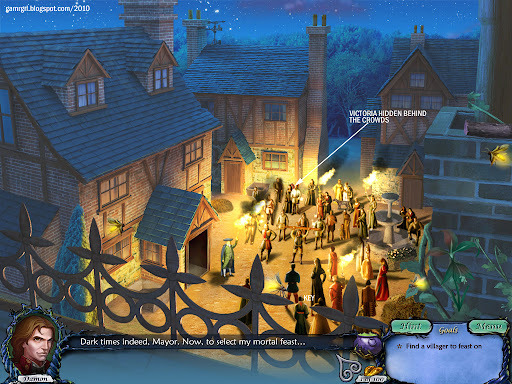 Click the eggs at the right window on the Mayor's roof. Click the nest at the left window of the Mayor's roof. Click the brick on the chimney at right. Click the empty slot on same chimney, extreme right, third row from top. Take the gold leaf from the left corner of Mayor's roof. Take the gold leaf in the ivy on chimney at right. Take the gold leaf exposed by the brick on the chimney. Exit the roof, the storage room, the butcher shop. Go to Victoria / Mayor's house. In her first meeting with Damon, Victoria recognises that he is a vampire but stands up to him. In the end, Damon has to leave as dawn is breaking. 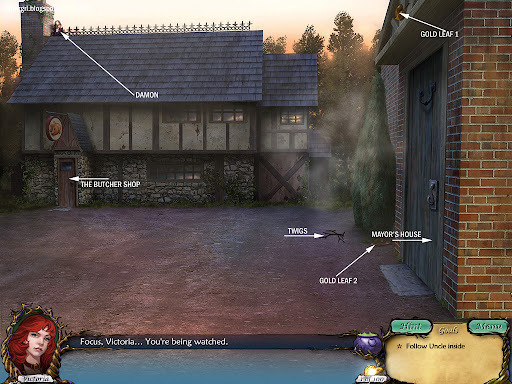 Victoria has to investigate her house for clues. Click the violin on the mantelpiece over the fireplace. 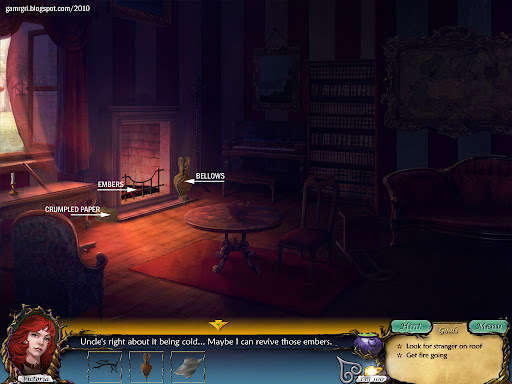 Click the case in front of the bookcase in the middle of the room. Click fruit 1 on the centre table. 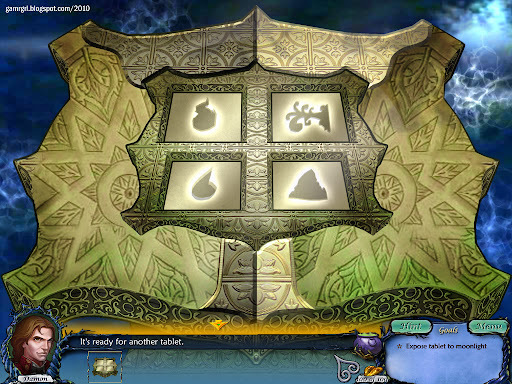 Click the bowl on the centre table. Fruit 2 behind the chair in the middle of the room. Fruit 3 at the extreme left of the room. Fruit 4 on the red sofa at right. Click music 1 on the map at extreme right. Click the rack on the piano at rear left. Music 2 below the red sofa. Music 3 on the mantelpiece above the fireplace. Take the gold leaf from the top right corner of the map. Take the gold leaf exposed by the music sheet under the sofa. Take the gold leaf exposed by the violin over the mantelpiece. Take the gold leaf exposed by the golden stone on the middle chair. Victoria has to track Damon the vampire to discover why he has left the golden stone in her house. Exit via the window at left to the bridge. Click here for the screenshot of the bridge. The bridge has been broken to prevent access to the forest. Victoria has to find a way to fix the bridge. Stone 1 on roof of house at left. Stones 2, 3, 4 and 5 on the riverbank. Stone 6 on the bridge. 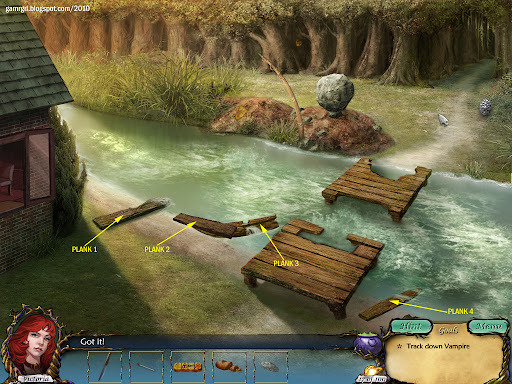 Click the broken boat in the stream. SOLUTION: Victoria has to collect planks by breaking the boat. Click a stone on the boat to get the targeting meter up. Click to throw the stone when the stone scrolling up and down the meter is at the center of the meter. Done correctly, Victoria gets 4 planks to fix the bridge, with one stone left over. Click here for the screenshot of the planks. Click the bridge. Repeat for remaining 3 planks. Victoria has to fill the hole on the other side of the bridge. Note the loose earth below the boulder on the other bank. INVENTORY: Click the last stone. Click the boulder. Use the same logic as breaking the boat. The bridge is now crossable. Take the arrowhead and white pinecone on the opposite bank. Take the gold leaf on the opposite bank. Take the gold leaf in the forest, rear middle, on the opposite bank. Note the fishing pole on the other bank [important later on]. Click here for the screenshot of the vine forest. Victoria has to find a way through the vine blockage. Take the white mushroom at bottom left. Take the white flower at bottom right. Take the two gold leaves on the bottom left tree trunk. Take the gold leaf on the bottom right tree trunk. The the gold leaf in the top right tree branches. Note the 4 pedestals at the centre of the clearing. Click the vines at the rear twice. Click the log in the middle of the screen. SOLUTION: The numbered circles around the fire on the left diagram refer to the position of the four pedestals. 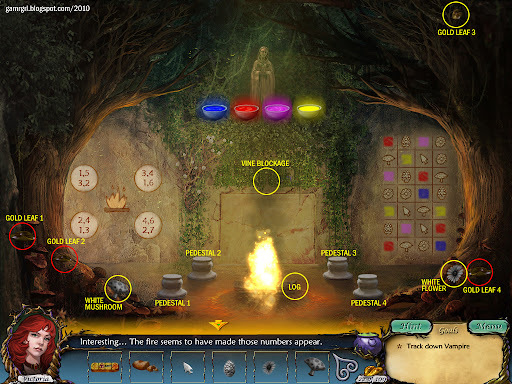 The numbers have to correspond to the grid in the right diagram, from left to right, top to bottom, to identify which coloured item - arrowhead, pinecone, flower, mushroom - go on which pedestal. On putting the currect coloured item on the correct pedestal, it gets activated with a coloured smoke symbol. The colours and signs of the activated pedestals should match the symbols on the golden stone. Starting from the top left circle numbers - 1, 5, 3, 2: 1 is a red item (not the pine cone, flower and mushroom, hence the arrowhead). Then count 5 more (i.e. the 6th slot) is a yellow item (not the mushroom and the flower, hence the pine cone). Then count 3 more (i.e. the 9th slot is a purple item, the flower). Then count 2 more (i.e. the 11th slot, which is red, and the remaining item, the mushroom). A red sign will appear above the bottom right pedestal. (Any of the other three numbered circles can be used to resolved any of the other 3 pedestals). Now only the arrowhead, flower and pinecone are available for use. 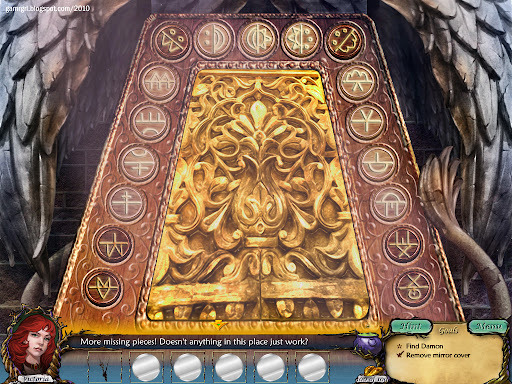 The rest of the puzzle can be solved by trial and error, using the golden stone symbols as reference - a blue sign (pinecone) over top right pedestal, a yellow sign (arrowhead) over top left pedestal, a pink sign (flower) over bottom left pedestal. A set of symbols is revealed on the wall behind the flames. Click each symbol till the icon matches the coloured icons floating over the pedestals. A grid is revealed on the wall behind the flames. Click the grid to bring up a new puzzle. INVENTORY: Click the golden stone. Click the holder at the bottom of the grid. SOLUTION: Each row and column should have a set of the four symbols, with no symbol being repeated. 5 of the symbols are pre-set. Click each covered tile to reveal a symbol. 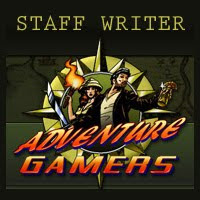 Once a set of symbols for a row / column is fixed, it activates flame-throwers from the sides of the grid. Start with the 2nd column from right for which tile 2 from top is the easiest to set, followed by the bottom tile of the column. Two ways open up beyond the vines. Go right to the forest house. Click the door of the house to enter. Victoria needs to unlock the door. Click the axe at the left of the vegetable garden. Click the log on the tree stump at bottom left. Click the ladle on the roof at left of spiderweb. Click the bucket at bottom right of the house. Click the hat on the highest roof of the house. Click the gnome at rear left of the vegetable garden. Click laundry 1 at the left of the steps to the house. Click the laundry rope just above laundry 1. Laundry 2, at the base of the steps to the house. Laundry 3, on the front roof edge of the house. Laundry 4, at the top right of the spiderweb. Take the gold leaf at the extreme top left of screen. Take the gold leaf at the extreme bottom left of the screen. Take the gold leaf on the roof above the house door. Take the gold leaf on the right wall of the house. Take the gold leaf at extreme bottom right of screen. INVENTORY: Click the house key. 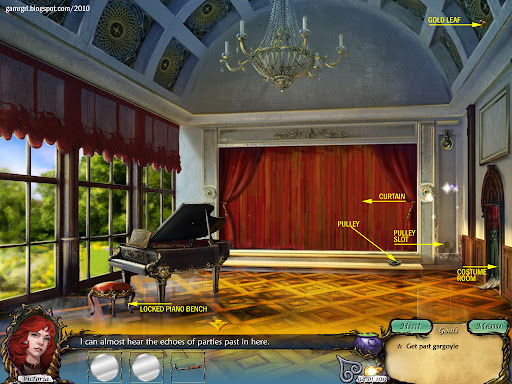 Click here for the screenshot of the parlour. Victoria has to find a cure for Odette's cough. Take the gold leaf on the floor at the right of the centre table. Take the gold leaf in the bouquet at top right. Click the stove at the left of the room. Victoria has to make the Cold-Be-Gone soup using the recipe. Click here for the screenshot of the menu. 8. The onion is automatically added to the shelf. Take the gold leaf from the right wall of the shelf. Click here for the screenshot of the house. Victoria has to take the carrot from the spiderweb at the right. Victoria has to find a way to get rid of the spider. Exit to the town. Go to the Mayor's house. Click the hat behind the chair in the middle of the room. Click the rack at the right of the fireplace. Click the coat on the floor at the front of the room. Click the mittens on the floor in front of the fireplace. Click the shawl on the sofa at the right. Country 1 below the red sofa. Country 2 above the bookshelf in the middle. Country 3 above the piano at the left of the bookshelf. Country 4 at bottom right of the fireplace. Take the gold leaf exposed by the shawl on the sofa. Take the gold leaf exposed by the coat on the floor. Take the gold leaf exposed by the country 4 shape. Click the safe exposed by the map on the wall. Take the key to the wine cabinet in the butcher shop's storage room. Exit the house. Go to the butcher shop. Click the lettuce at the extreme right on the front counter. Click the bread slice in the middle on the front counter. 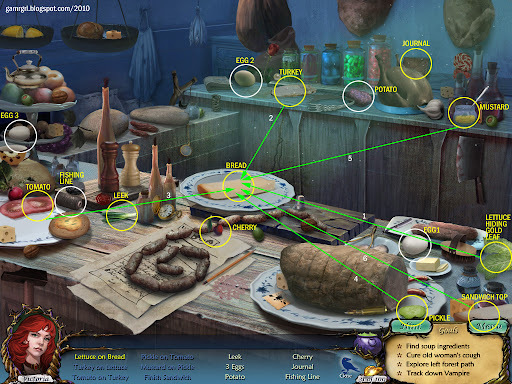 Click the turkey slice on the left-middle of the rear counter. Click the bread + lettuce slice. Click the tomato slice at the extreme left of the front counter. Click the bread + lettuce + turkey slice. 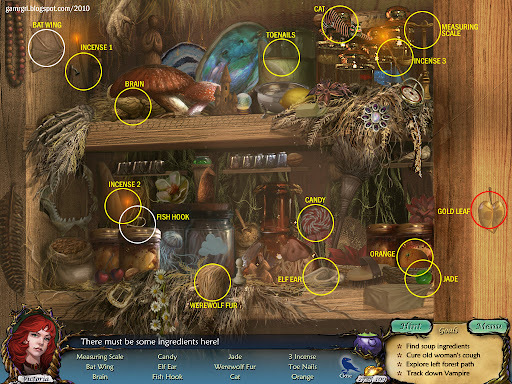 Click the pickle at the bottom right of screen (above Hint button). Click the bread + lettuce + turkey + tomato slice. 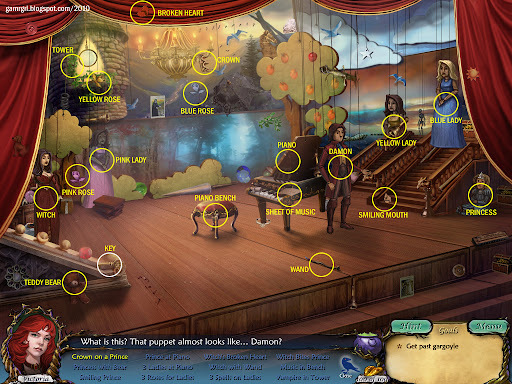 Click the mustard at the extreme right of the rear counter. Click the bread + lettuce + turkey + tomato + pickle slice. Click the bread slice at the bottom right of screen (above Menu button). Click the bread + lettuce + turkey + tomato + pickle + mustard slice. Take the gold leaf exposed by the lettuce. The egg, potato and fishing line is added to the inventory. INVENTORY: Click the wine cabinet key. Take the bottle of brandywine and the gold leaf inside. Exit the storage room and the butcher shop. Go to the bridge outside the forest. Victoria has to get a fish from the stream. INVENTORY: Click the fishing line. 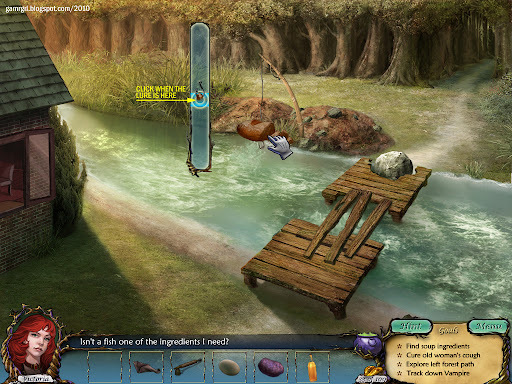 Click the fishing rod on the opposite bank of the river. INVENTORY: Click the fishing hook. Click the rod + fishing line. Victoria needs bait to lure the fish. SOLUTION: Victoria has to lure a fish using the bread. 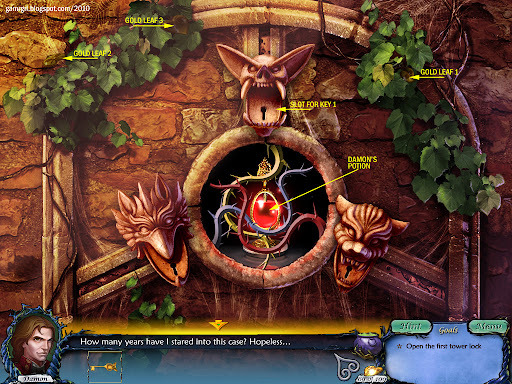 Once the targeting meter comes up, click when the lure is at the centre of the target to catch the fish. The fish is added to the inventory. Enter the forest. Go left to the castle gate. The unicorn horn is added to the inventory. Take the gold leaf from the top left of the gate. Take the gold leaf from the tree at top right. Take the gold leaf from the bottom right of the gate. Exit to the forest. Go right to Odette's house. INVENTORY: Click the bug spray. Take the carrot from the web. Enter Odette's parlour. Click the stove. The ingredients are automatically added to the shelves. Click here for the screenshot of the counter. Victoria has to make the soup as per the recipe. Click the potato on the shelf. 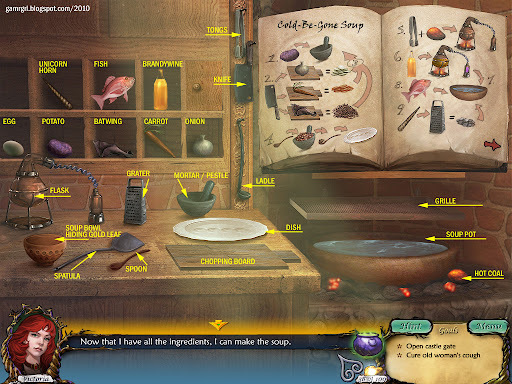 Click the mortar / pestle on the counter. Click the onion on the shelf. Click the chopping board on the counter. Click the knife hanging at the right of the shelf. Click the mortal / pestle. Click the carrot on the shelf. Click the batwing on the shelf. Click the brown spoon on the counter. The brown spoon now has the mixture on it. Click the white dish on the counter. Repeat thrice to fill the dish. Click the tongs at the right of the shelf, above the knife. Click the hot coal at the extreme right of the screen. Click the flask at the left on the counter. The ember is now heating the flash. Click the brandywine bottle on the shelf. Click the small filled flaskette. Click the soup pot at the right on the stove. Click the fish on the shelf. Click the unicorn horn on the shelf. Click the grater on the counter. Click the grated unicorn horn. Click the arrow at the bottom right corner of the book to turn the page. Click the dish with the mixtures. Repeat thrice till the dish is clear. Click the egg on the shelf. Click the grille above the soup pot. 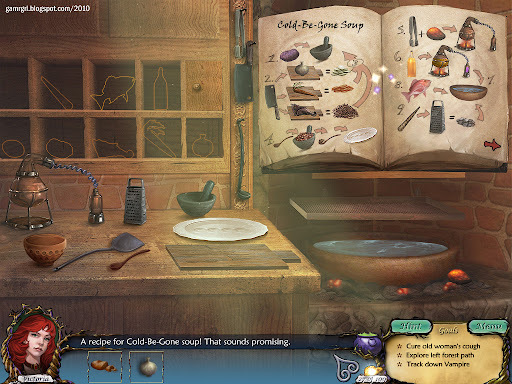 Click the ladle hanging at the right of the shelf. Click the bowl at the left on the counter. Repeat thrice till all 4 dumplings are in the bowl. Click the spatula on the counter. Click the poached egg in the grille. Click the soup bowl on the counter. The soup is ready. Take the soup bowl. Take the gold leaf exposed by the soup bowl. INVENTORY: Click the soup bowl. 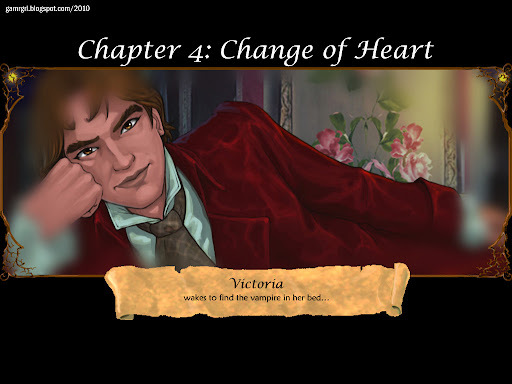 Odette tells Victoria that Damon is compelled to act on his evil instincts by evil witch Victoria, and that there is a potion, protected by daylight, that can make him whole again if there is still humanity left in his heart, and then he can be free of the witch. She also says there is another mystery of the Fates that is yet unclear to her. 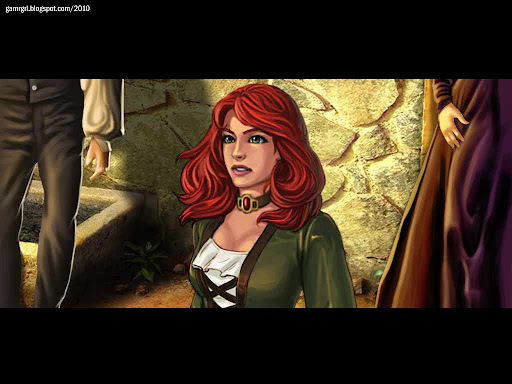 Odette gives Victoria two mirror shards to open the castle gate. Exit the parlour. Go to the forest. Go left to the castle gate. Click the circular lock at the center of the gate. INVENTORY: Click a mirror shard. Click the empty slot at the top right of the lock. Click the empty slot at the bottom right of the lock. SOLUTION: Victoria has to rotate the prisms by clicking on them such that the beam of light illuminates all three mirrors. The blue prism is fixed. Take the mysterious tablet released by the lock. Click to enter castle courtyard. Victoria is attacked by Celeste's minion... Damon saves her, and takes her to his room. Damon is curious about why Victoria has risked her life to enter the castle. Click Victoria. The gargoyle table is added to the inventory. Damon has to fix Victoria's bleeding wound. 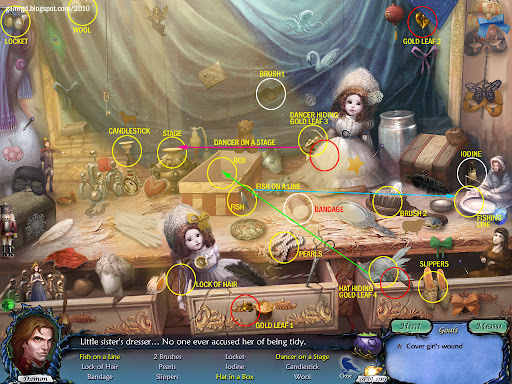 Click the fish at the right of the box in the middle of the table. 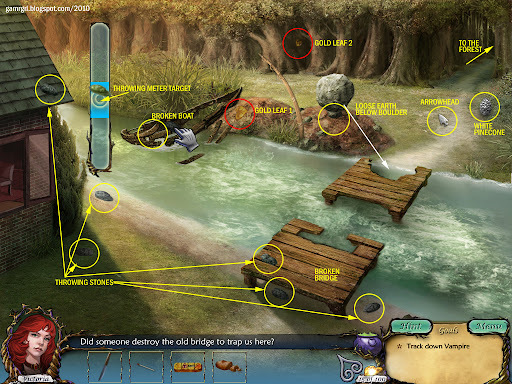 Click the fishing eskimo at the extreme right on the table. Click the dancer behind the large white doll on the table. 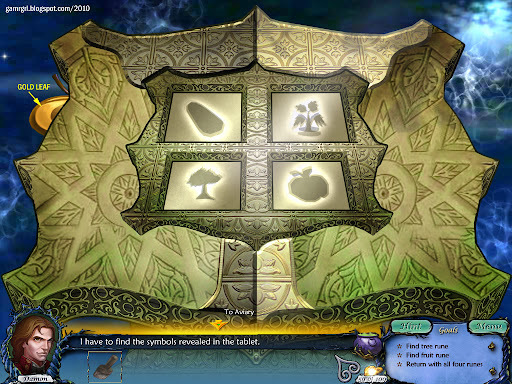 Click the stage at the rear left of the box in the middle of the table. Click the hat in the right-side drawer. Click the box in the middle of the table. Take the gold leaf beside the knob of the front central drawer. Take the gold leaf behind the blue napkin at top right. Take the gold leaf exposed by the hat in the right drawer. Take the gold leaf exposed by the dancer. The bandage, brush and iodine are added to the inventory. Take the gold leaf on the bureau at right. Damon has to take the tablet to the aviary to expose it to moonlight. Exit to the courtyard. Go to the aviary via right gate. Click here for the screenshot of the aviary. Take the gold leaf on the grass at the right of the central tree. Take the 10 gold leaves in the central tree. Click the moonlight pedestal at the centre. INVENTORY: Click the gargoyle symbol. Click here for the screenshot of the pedestal. Take the gold leaf hidden behind the pedestal at left. Exit the pedestal. Go to the courtyard. Click here for the screenshot of the courtyard. Click the fallen balcony stone at the foot of the aviary gate. Damon needs 5 drops of blood to be able to remove the stone. Take a blood drop from the puddle at the foot of the aviary steps. Click the bloody rock in the grass at bottom right. Click the bucket of blood beside the wall at right. Click the pavers at the foot of the steps to the castle. Blood has seeped underneath the pavers. Damon has to find a way to move the pavers. Click the bloody roots of the tree beside the balcony stone. Damon has to find a way to extract the blood from the tree. Click the bloody rock at the foot of the tree at left. Take the wooden plank against the left wall, beside the tree. Note the rubble of stones at bottom left. Damon needs the iron bar embedded inside. Damon needs leverage to clear the stones. Go to the garden via the gate at left. 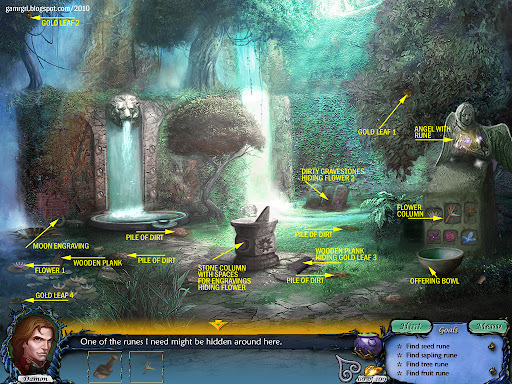 Click here for the screenshot of the garden. Click the angel statue at right. Damon needs to arrange a trade with the angel. Take the flower in the water at bottom left. Take the moon engraving from the ground at left of the lion fountain. Take the wooden plank for the pond-side at bottom left. Click the three dirty gravestones at the rear of the garden. Take the flower exposed by the gravestones. Take the gold leaf from the tree at extreme top left. Take the gold leaf from the tree at right. Take the gold leaf in the pond at extreme bottom left. Take the gold leaf exposed by the plank beside the engraving tower. Note the 4 piles of dirt around the stone column in the middle. Damon has to find out what's buried in there. 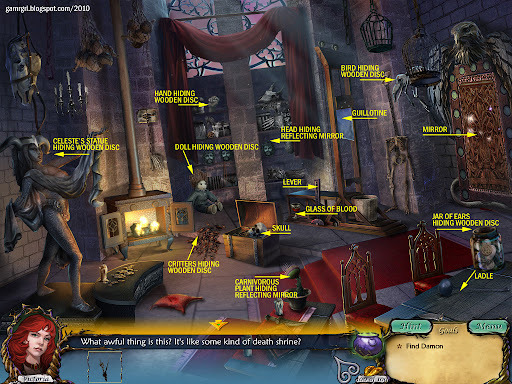 Click the raven with the list of hidden objects. Take the flower frm the bottom right, just above the Hint button. Take the sun engraving from the bottom left. Take the rune from the extreme middle right of the screen. Take the gold leaf from extreme top left. Take the gold leaf on the ground in the middle of the screen. Take the gold leaf from the log at bottom right. Take the gold leaf exposed by the skull. INVENTORY: Click the moon engraving. INVENTORY: Click the sun engraving. INVENTORY: Click the first wooden plank. 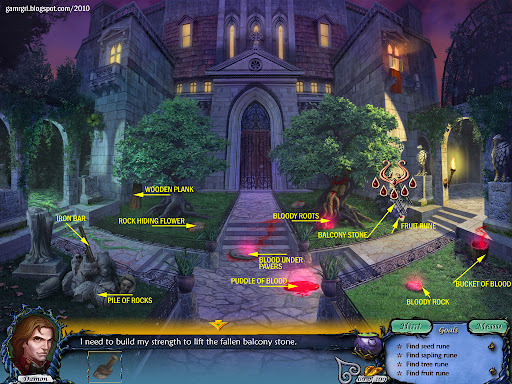 Click the stone rubble at bottom left. INVENTORY: Click the second wooden plank. INVENTORY: Click the third wooden plank. INVENTORY: Click the iron bar. Click the pavers at the foot of the castle steps. Take the three sharp stone pavers. Take the drop of blood. INVENTORY: Click a stone paver. Click the tree with the bloody roots. Repeat for the other two pavers. Exit at the bottom of the screen to the castle gate. Click the tooth at the foot of the tree at bottom right. Click the nail in the stone block above the wall at top right. 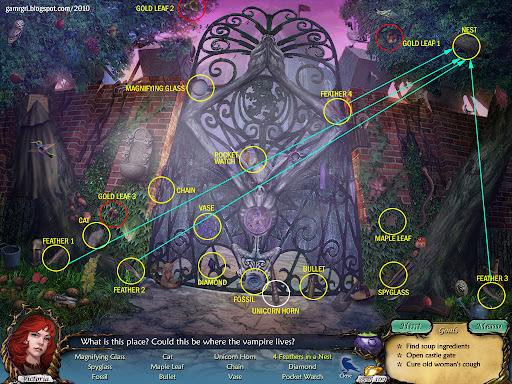 Click the dagger at the middle of the gate's right frame. Click the cloak hanging at the left of the screen. Click the lion's head at the foot of the tree at bottom right. Click the stone slab with lion heads on the left wall. Take the tree rune in the grass at the bottom left. 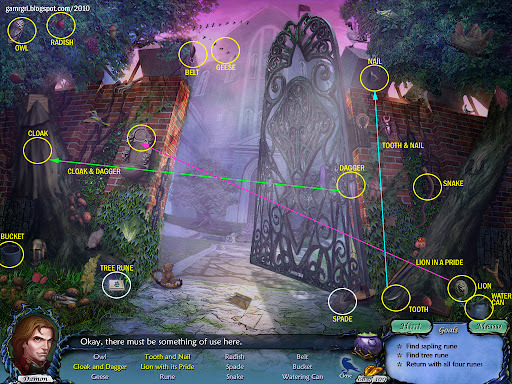 Take the spade at the foot of the gate at bottom right. Click a pile of dirt at the bottom right of the gravestones, behind the sun/moon column. 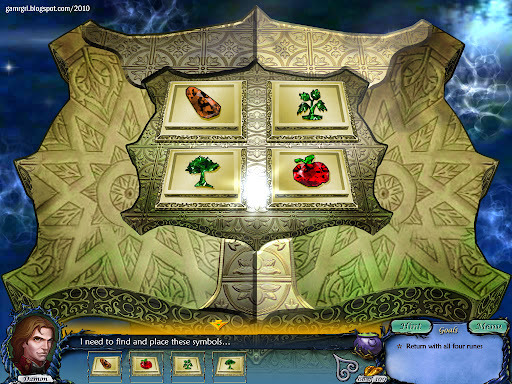 SOLUTION: Damon has to place the flowers in his inventory in the slots below the angel. Click a flower, then click the matching image on the angel's column. The flowers are placed around the offering bowl. Take the sapling rune from the angel's hand. Now Damon has all the 4 runes. Go to the aviary. Click the pedestal. SOLUTION: Damon has to place the 4 runes in the gargoyle tablet. Click a rune in the inventory, then click the correct slot from the silhouettes to place it on the tablet. 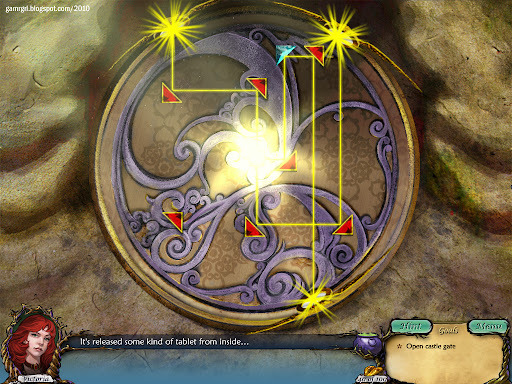 The will-o'-wisps inform Damon that the key is required to unlock the tower, and that he needs to find more keys. Damon has to open the first tower lock. Click the tower at top right to go to Damon's bedroom. Take the gold leaf on the ground at the right of the coffin. Click the tower lock door on the rear wall. Click here for the screenshot of the lock. Take a gold leaf from the top right vines. Take 2 gold leaves from the top left vines. One of the barriers blocking the potion is broken. It's nearing dawn, and Damon goes to visit Victoria. Victoria awakens to find Damon in her bed, waiting for her. 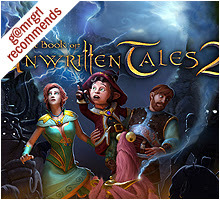 He wants her to find the second gargoyle tablet that would give him the second key. 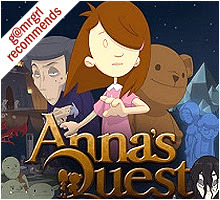 He warns her to stay away from the castle's creatures after sundown, and leaves for the day. Take the gold leaf on the bed. Click the door at right. The door is locked and there is no keyhole. Click the black mask on the chest at extreme left middle. Click the peg at the extreme right, between the two masks. Click the princess in the left drawer. 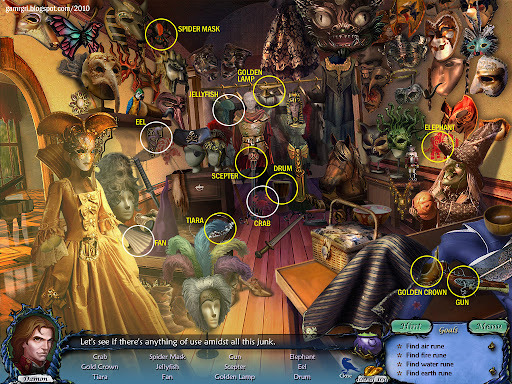 Click the prince at extreme left middle, behind the black mask. Take the gold leaf exposed by the princess in the left drawer. The dog, key and sheep are added to the inventory. Click the tapestry on the rear wall to reveal an antechamber. Take the gold leaf exposed by the folded tapestry. Click the rocking horse at rear left. There is something inside. Victoria needs to open the horse. Take the gold leaf on the bureau at extreme right. Take the gold leaf against the wall at extreme left middle. Take the gold leaf on the blackboard on the rear wall. Click the locked chest at bottom left. Click the baby doll at the rear leg of the rocking horse. Click the crib at middle right, at the left of the bureau. Click the cup at the left corner of the open chest. 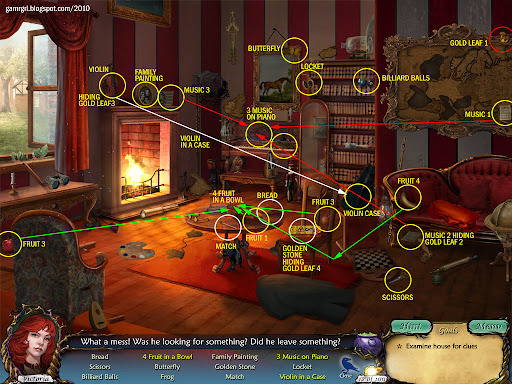 Click the saucer at the top left edge of the rug at bottom right. Click the B block at the right corner of the chest at left. Click the empty block for B on the blackboard. Click the C block inside the chest at left. Click the empty block for C on the blackboard. Click the D block in the bottom shelf of the bureau at right. Click the empty block for D on the blackboard. Click the E block near the front leg of the rocking horse. Click the empty block for E on the blackboard. The reflecting mirror is behind the baby doll. The cow is behind the cup on the chest. Take the gold leaf exposed by block E, near the front leg of the horse. Take the gold leaf exposed by the block D, beside the chest. The carrot and dynamite are added to the inventory. Take the wooden pig from the saddle of the horse. Victoria has to open the door. SOLUTION: Victoria has to fit the four wooden animals on the correct slots marked on the door. Click an animal in the inventory, then click on the corresponding shape slot on the door. Sheep at top left, dog at bottom left, cow at top right, pig at bottom right. Victoria has to find a staircase. Click here for the screenshot of the hallway. Take the gold leaf on the ceiling, at the left of the chandelier. Take the gold leaf in the first (left) painting on the left wall. Click the rubble at the bottom left. Victoria needs something more to blow the rubble. Enter the weapons room via the door at right. The knight is on the horse at left. Click the iron boot in the bottom right shelf. Click the iron helmet at extreme top right. Click the shield under the coat of arms on the rear middle wall. Click spear 1 at extreme right, on the wall. Click the spear rack on the middle right wall. Click spear 2 on the ceiling at top right. Click spear 3 at the left of the mirror on left side. The dynamite and scythe are added to the inventory. Take the gold leaf in front of the horse's front foot at bottom left. Take the gold leaf on the carpet in the middle of the room. Take the gold leaf exposed by the helmet at top right. Take the gold leaf exposed by the knight's shield. Take the gold leaf above the left eye of the monster on the rear wall. Exit the room. Go to the hallway. Click the door with the foliage at right. Victoria has to get rid of the bird and take the key in the nest at top left. Crank the handle of the music organ at left. A mechanical bird is raised. The real bird likes the music. Victoria has to find the remaining three flutes. Click the ivy at the extreme left, below the nest. Click the red flute. It's added to the inventory. Click the flute in the inventory. Click the ivy on the rear left pillar. Click the blue flute. It's added to the inventory. Click the ivy on the rear right pillar. Click the pink flute. It's added to the inventory. SOLUTION: When the organ is cranked, the mechanical bird pops out. Seeing it, the real bird lets out a tune, indicated by the colours of the music signs. Victoria has to replicate that tune using the organ, by playing the particular coloured flutes in order. The real bird comes to sit with the mechanical bird on the organ. Take the key from the nest. Take the gold leaf on the floor at bottom left. Take the gold leaf on the floor at bottom right. Take the gold leaf on the floor at rear left, beside the large pot. Click the door on the rear wall. Click the mirror at the rear bottom right, behind the cello. Click the dark patch on the wall at rear middle top. Take the gold leaf under the table at bottom left. Take the gold leaf at the middle right on the table. Take the gold leaf on the second shelf from top of the bookshelf. Take the gold leaf at the bottom right of the bookshelf. Take the gold leaf exposed by the mirror at bottom right. Now all three dynamites are in place. Click a dynamite. Repeat for other two dynamites. Go down the stairs to the grand foyer. Click here for the screenshot of the foyer. Victoria needs to get past the gargoyle at left. Click the gargoyle. It needs 4 reflecting mirrors. Click the clock at the rear. It needs its hands. Take the gold leaf at the extreme bottom right. Note the fountain's engravings [important later on]. Exit via the door on the right to the ballroom. 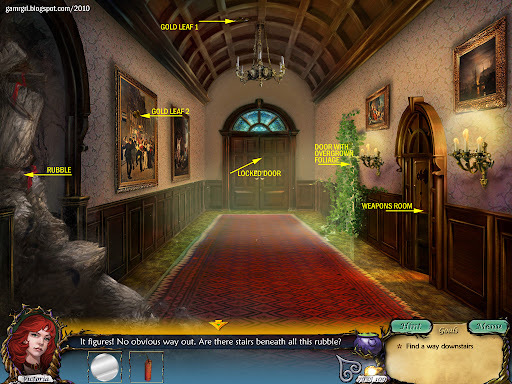 Click here for the screenshot of the ballroom. Take the gold leaf on the ceiling at extreme top right. Victoria needs to remove the curtain covering the stage. Take the pulley at the bottom right of the stage. 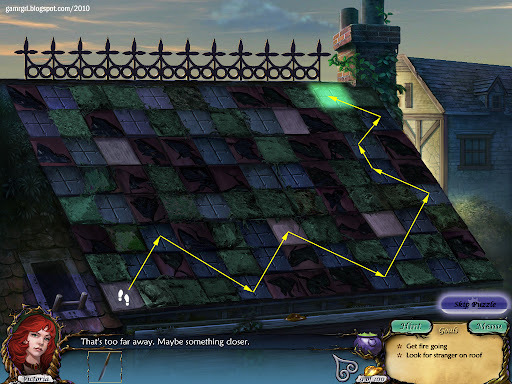 Click the hook at the bottom of the column at the right of the stage. Victoria has to find the rope to use the pulley. Note the locked piano bench at left [important later on]. Exit via the door at right to the costume room. Click the laughing mask at the bottom right, below the witch. Click the crying mask at top middle, above the rear rack. A reflecting mirror and rope is added to the inventory. Take the 2 gold leaves on the mannequin at bottom left. Take the 2 gold leaves on the shelf at the top right of the mannequin. 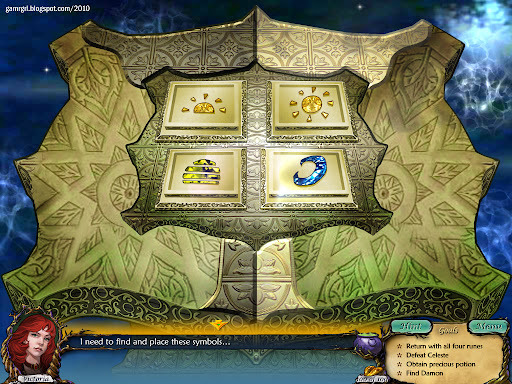 Take the gold leaf on the table at the bottom middle of the screen. NOTE: This completed my 100 gold leaves. After this point, there were no more gold leaves on my screens, hence none are mentioned in the walkthrough from here on. Exit to the ballroom via the door at left. Click the pulley system at the right of the stage. 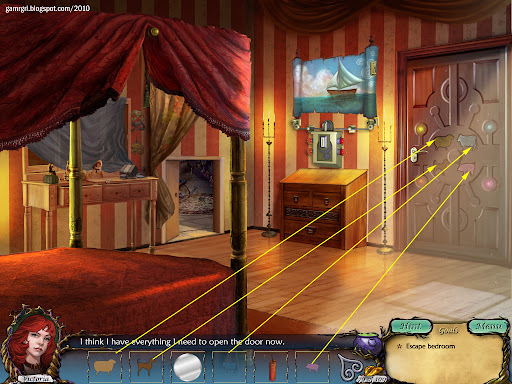 Click the fixed rope to remove the curtain. One of the puppets looks like Damon! 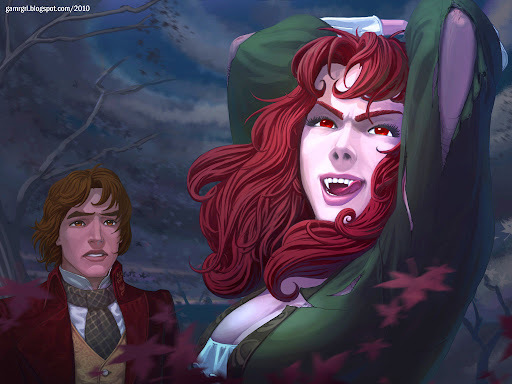 Victoria has to do the tasks in order to have the puppet theatre narrate Damon' story, of how he became a vampire. Click the crown hanging from the chandelier at top middle. Click the prince puppet, i.e. Damon, at the centre. Click the teddy bear beside the banister at bottom left. Click the princess puppet i.e. Damon's sister, beside the steps at right. Click the smiling mouth at the foot of the steps at right. Click the piano bench in the middle. Click the lady in pink at rear left. Click the piano in the middle. Repeat for the lady in yellow and lady in blue on the steps at right. Click the pink rose at the rear left, at the right of the tree. Click the lady in pink beside the piano. 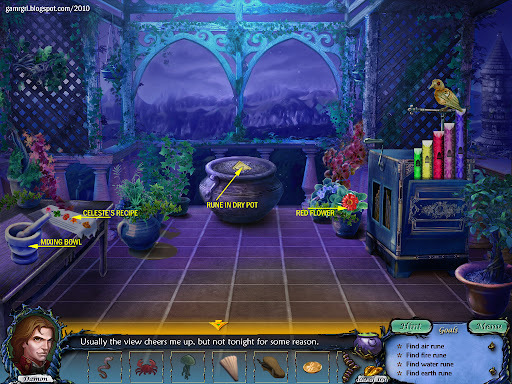 Click the yellow rose at top left, above the tree. Click the lady in yellow beside the piano. Click the blue rose below the chandlier at rear middle. Click the lady in blue beside the piano. 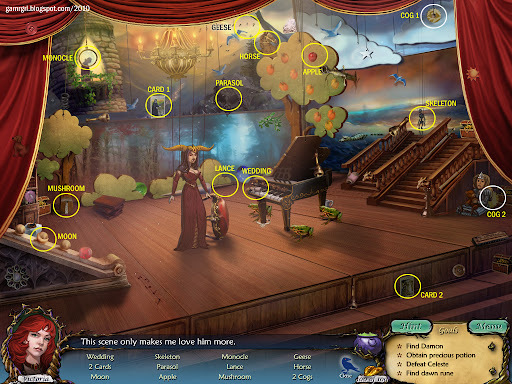 Click the broken heart at top middle, in the folds of the curtain. Click the witch in red at left, beside the curtain. 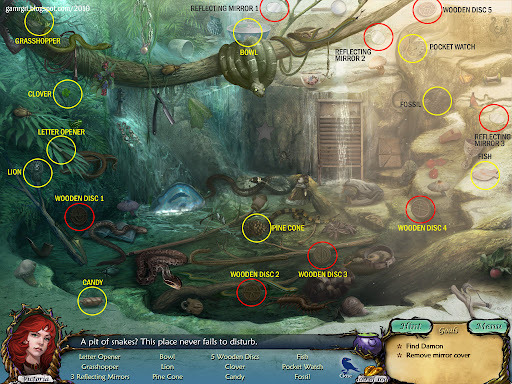 Click the wand on the floor at bottom middle. Click the pink lightning blaze around the witch puppet. Click the lady in pink. 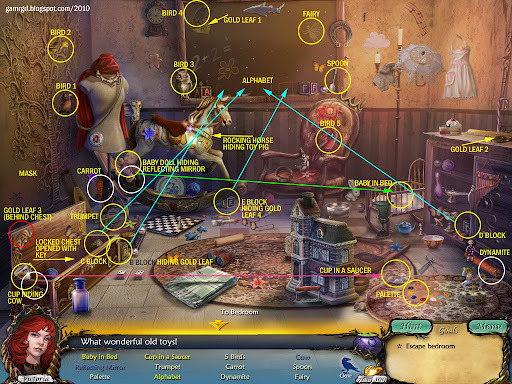 Click the blue lightning blaze around the witch puppet. Click the lady in blue. 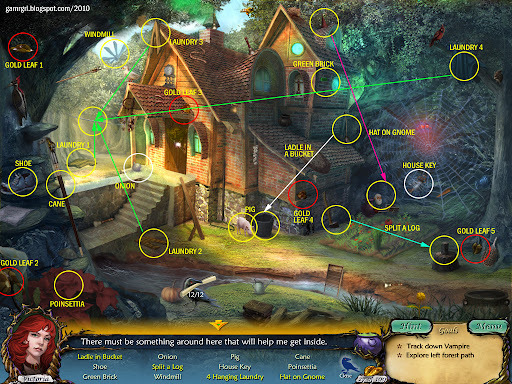 Click the yellow lightning blaze around the witch puppet. Click the lady in yellow. Click the sheet of music on the piano. Click the open piano bench where Damon was sitting. Click the tower at top left. A key is added to the inventory. Exit automatically to the ballroom. Victoria has to find Damon's music and then play it. Click the piano bench at left. Take the sheet of music i.e. Damon's music. Victoria has to tune the piano. INVENTORY: Click the piano tuner. Take the reflecting mirror from the floor near the piano. Victoria feels Damon's music is incomplete. Go to the grand foyer via exit at bottom of screen. Victoria needs to open the gargoyle lock. Click the gargoyle statue at the left of the room. INVENTORY: Click a reflecting mirror. Repeat for the remaining three reflecting mirrors in the inventory and the three slots on the lock. SOLUTION: Victoria has to rotate the prisms by clicking on them such that the beam of light illuminates all four mirrors. Take the gargoyle tablet released by the lock. Go to the courtyard via the open door at left. Another of Celeste's minions attacks Victoria, but Damon saves her again in the nick of time. He asks her to escape to the aviary. Click the gate to the aviary at the right. Victoria confronts Damon about his feelings for her, but he denies having any - for her, or otherwise. He wants the gargoyle tablet. Damon has to use the second gargoyle table to get the second key to the tower lock. 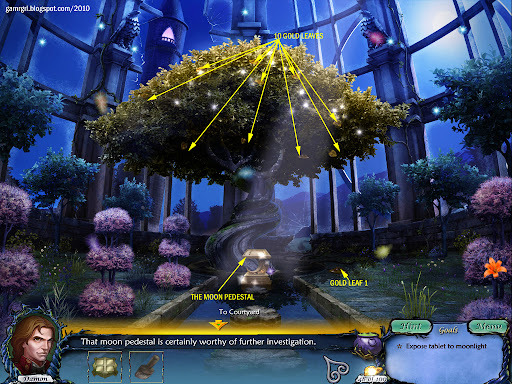 Click the moon pedestal at the centre of the aviary. Enter the castle via door at centre. Click the fountain at the centre. There is a rune in the fish's mouth. Damon needs all the engravings of the fountain to release the rune. Take the mermaid's tail at the left corner of the fountain. Enter the ballroom via the door at right. Go to the costume room. The eel, jellyfish, crab engravings, and fan are added to the inventory. Exit to the ballroom. Go to the hallway via exit at bottom of screen. The fish engraving, foot pedal and gold coin are added to inventory. Exit the study. Go to the balcony. Click here for the screenshot of the balcony. Note the rune in the pot at the rear centre. Damon needs to wet the soil to release the rune. Note the mixing bowl on the table at left. Click the recipe on the table: one of Celeste's. Damon needs 4 flowers to complete the recipe: pink, green, red, orange. Take the red flower in the pot at the left of the music organ. Exit the balcony. Go to the weapons room. Click the candle on the floor at left-centre of the room. Darren has to restore the fiery essence of the rune. Collect all eleven unlit candles in the room. INVENTORY: Click an unlit candle. Click the curving track in the middle of the floor. Damon needs a way to light the candles. INVENTORY: Click the foot pedal. Click the dragon grinding stone at the right of the room. Damon needs a way to create friction to light a spark. Take the axe at the rear left of the room, beside the mirror. The candles are lit. Take the fire rune. 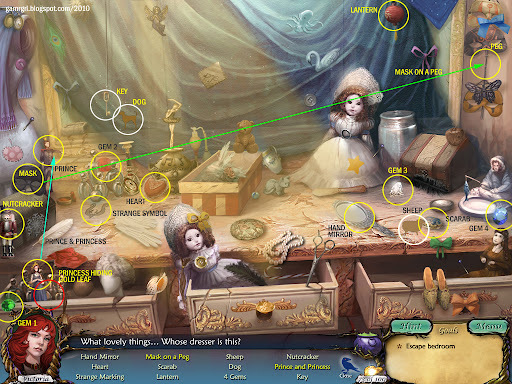 Click the crystal ball in front of the bottles of perfume at left on the table. 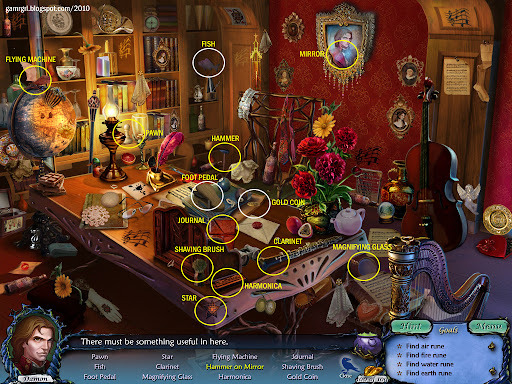 Click the fortune teller doll in the extreme right drawer. Click the star on the skirt of the big white doll at right. Click the blue kerchief at the extreme top right corner. The octopus engraving and a gold coin is added to the inventory. Exit automatically to the room. Enter the antechamber via the door in the rear wall. Click the queen piece at the base of the bureau at right. Click the pawn piece on the chessboard at the base of the rocking horse. 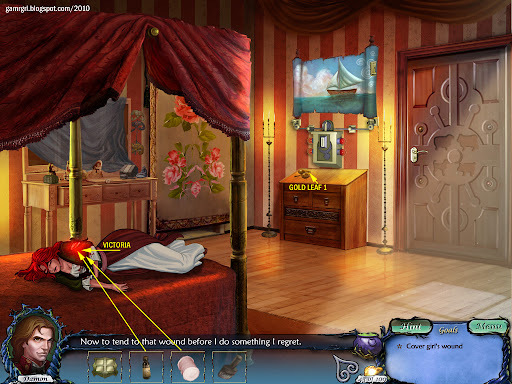 Click the doll at the foot of the bureau at right. Click the dollhouse on the floor in the middle. Click the two dice on the floor in front of the chest at left. 'Snake Eyes' are when both die have one dot on their up faces. The shark engraving, gold coin and empty jar are added to inventory. Take the gold coin on the bureau at the right. Note the rune stuck to the painting on the right wall. Click the contraption below the painting. Damon needs 4 coins to reveal more of the painting. Click the contraption. 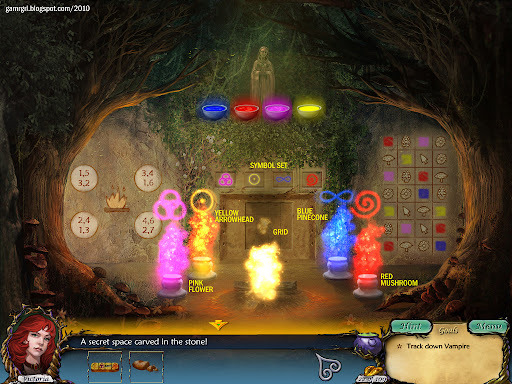 One of the red lights turns green and the painting scrolls to the left, revealing more of the rune. 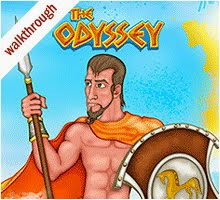 Repeat for the three other coins. The air rune is revealed. But it needs more energy to be activated. INVENTORY: Click the paper fan. Go downstairs and outside to the courtyard. Take the mermaid head from the rubble at extreme bottom left. Take the green flower from the third from left arch of the gate to the garden at left. Take the orange flower at the extreme bottom right of the screen. Exit the aviary. Go to the grand foyer. 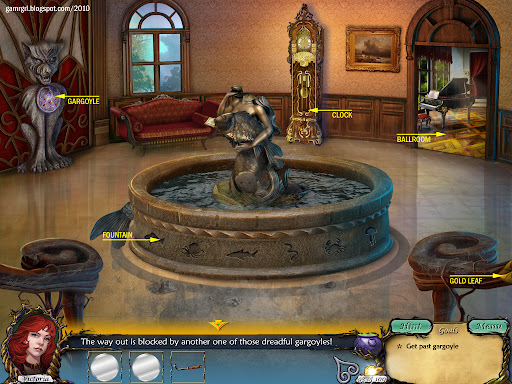 SOLUTION: Damon has to fit the engravings of the creatures into the corresponding shapes on the side of the fountain. He also has to replace the mermaid's head and tail on the statue. INVENTORY: Click the fish engraving. 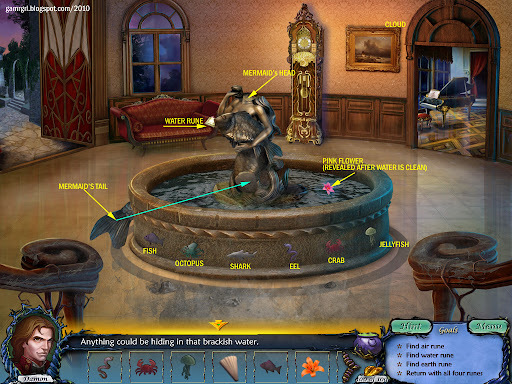 Click the fish slot at extreme left of the fountain. Repeat for the octopus, shark, eel, crab and jellyfish engravings, from left to right. INVENTORY: Click the mermaid's head. Click the neck of the mermaid statue in the fountain. INVENTORY: Click the mermaid's tail. Click the lower middle portion of the mermaid statue. Take the pink flower revealed by the clean water. INVENTORY: Click the empty jar. Click the water spewing out of the fish's mouth. Take the jar of water. Exit to the hallway at the bottom. Go to the balcony. INVENTORY: Click the jar of water. Click the large pot with the rune at the rear. The rune needs more life force to be activated. Damon needs to use Celeste's recipe to free the rune. SOLUTION: Damon has to add the four flowers in the order specified in the recipe sheet to the mixing bowl. INVENTORY: Click the pink flower. Repeat for the green, red and orange flowers. The fast growth powder is ready. Take the mixing bowl with the powder. INVENTORY: Click the mixing bowl. Click the pot with the rune. Damon has to open the second tower lock. The second barrier blocking the potion is broken. Celeste returns to see Damon trying to unlock the potion. Victoria wakes up in the aviary. Damon is missing. 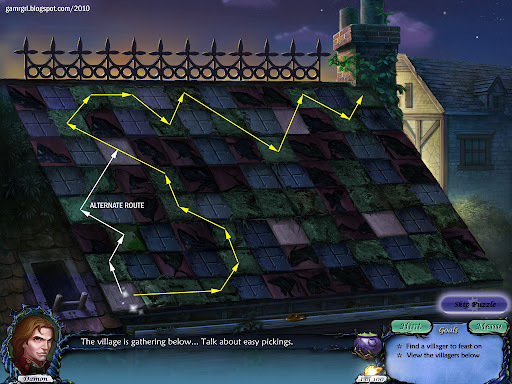 The will-o-wisps ask her to search for Damon in the garden. Exit the aviary. Go left to the garden. Take the valve from the ground at the edge of the pond at left. Take the valve from the ground in front of the sundial at the centre. Take the valve from the ground at the foot of the angel statue at right. 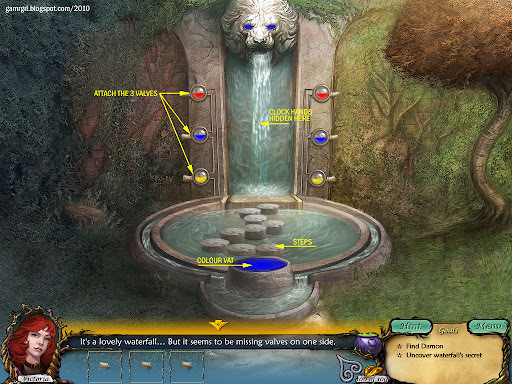 Click here for a screenshot of the waterfall. Click a valve slot on the left side of the waterfall. Repeat for the other two valves. Take the hands of the clock on the wall of the waterfall. 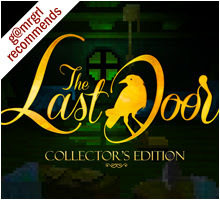 Click the doorway to enter Celeste's chamber. 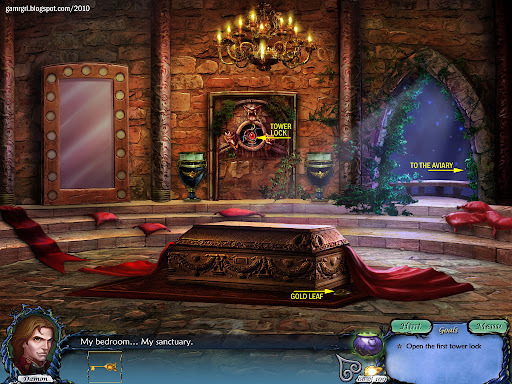 Click here for a screenshot of the room. Click the mirror at extreme right. Victoria needs to find the 11 missing discs to unlock the mirror. Take the glass of blood on the ground at the left of the guillotine. Click the head on the second shelf from bottom on the rear wall. Click the hand on the top left shelf on the rear wall. Take the wooden disc in the hand. Take the doll from the ground at the left of the rear shelf. Take the skull in the chest in the middle of the room. Click the pile of dead critters at the left of the chest. Take the wooden disc hidden underneath them. 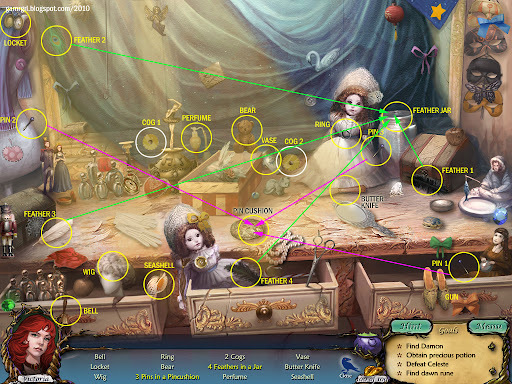 Take the ladle from the table at extreme bottom right. INVENTORY: Click the glass of blood. 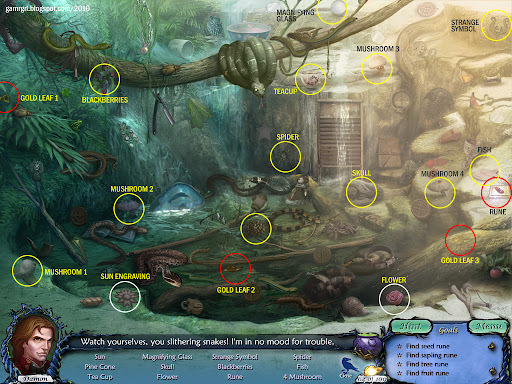 Click the carnivorous plant the bottom middle. Click the lever in the middle of the guillotine. Take the wooden disc from the beheaded doll. 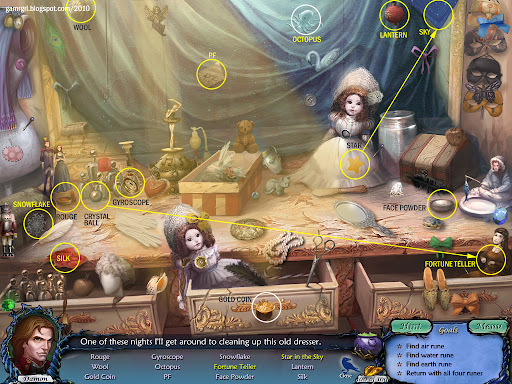 Click the jar of ears on the table at extreme right. Take the wooden disc on the table. Click the extended left hand of Celeste's statue at the left. Take the wooden disc from her body. Click the dead bird in the cage hanging from top right. Take the wooden disc in the beak of the bird. The 3 reflecting mirrors and 5 wooden discs are added to the inventory. Victoria has all 11 wooden discs now. Exit automatically to the garden. Return to Celeste's chamber. Click the mirror at right. SOLUTION: Victoria has to place the wooden discs in the slots available around the mirror. The lower half of each disc mirrors the upper half of the disc adjacent to it. For example, for the two fixed discs at bottom left, the 'M' shape of the upper half of the first disc mirrors the 'W' shape of the lower half of the disc above it. Similarly, the 'X' shape of the two discs at bottom right. 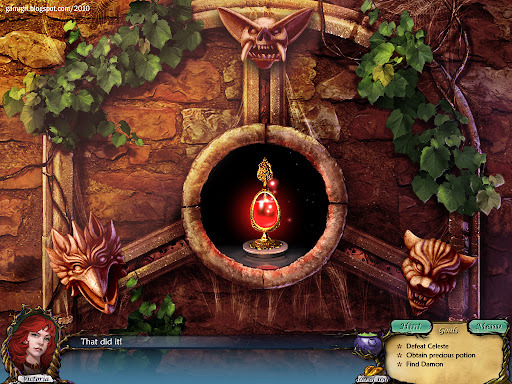 The mirror opens to reveal another gargoyle lock. Click the empty slot at the top left of the lock. Repeat for the remaining four reflecting mirrors in the inventory and the four slots on the lock. SOLUTION: Victoria has to rotate the prisms by clicking on them such that the beam of light illuminates all five mirrors. Exit automatically to Damon's room. Victoria sees Celeste with Damon. 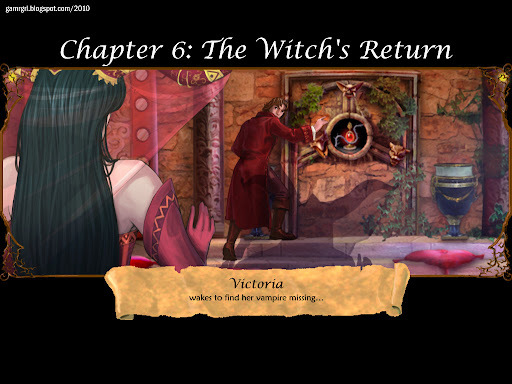 Victoria awakes in Celeste's chamber - the mirror is broken and leads to Damon's room. Victoria has to save Damon from Celeste's clutches. Victoria needs to place the gargolye tablet on the moon pedestal. Exit the chamber. Return to the aviary. Click the clock at the rear middle of the grand foyer. INVENTORY: Click the clock hands. Click the blank clock face. 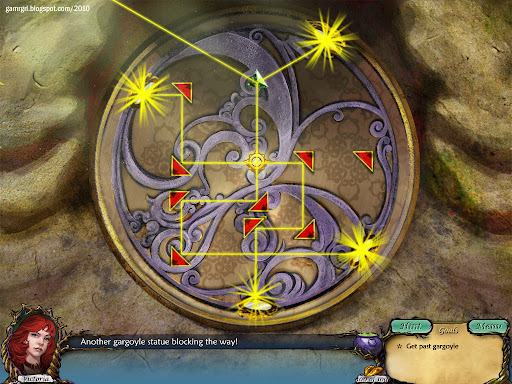 Victoria has to find the 12 gear cogs to free the runes from the clock. Exit the clock. Enter the ballroom. Take the gear cog hanging at extreme top right. 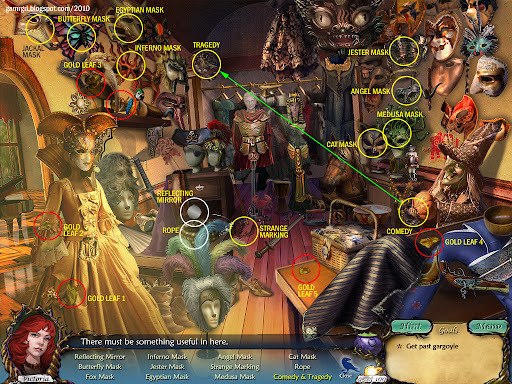 Take the gear cog behind the princess doll at bottom right. Take the gear cog on the table at front middle. Take the gear cog above the Egyptian lady at middle rear. Exit to the ballroom. Exit to the foyer. Go upstairs to the hallway. Enter Damon's sister's room. Take the gear cog at the left of the dancer statue at rear middle. Take the gear cog at the left of the white doll on the table. Exit automatically to the bedroom. Take the gear cog at the foot of the rocking horse. Take the gear cog on the top shelf of the bureau at right. Exit to the bedroom. Exit to the hallway. Go to the weapons room. Take the gear cog above the tapestry behind the knight at left. Take the gear cog behind the candle track in the middle on the floor. Exit to the hallway. Go to the study. Take the gear cog in the middle shelf on the left wall. Take the gear cog at the centre of the desk. Exit to the hallway. Go down to the clock. 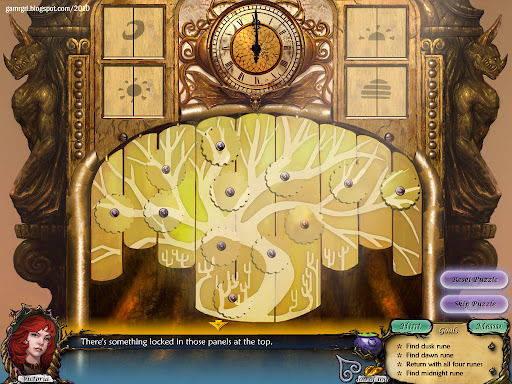 SOLUTION: Victoria has to fit the gears into their slots so as to complete the image of the tree on the clock. The cogs each have a part of the image. 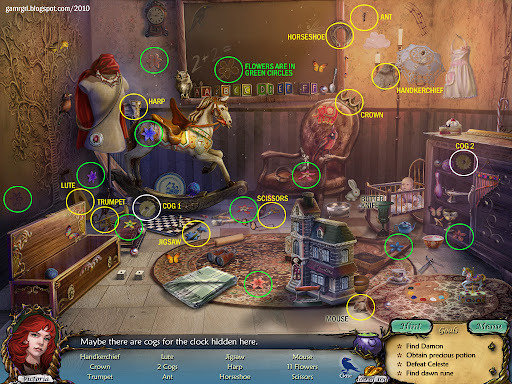 Click a cog in the inventory, then click a slot on the clock to place it. Then click the cog and keep the mouse pressed to rotate clockwise till the image on the cog is aligned with the big picture. A correctly put cog locks into place. Click the central knob of a cog to pick it off the clock. HINT: Start with cogs with less branched images which are easier to place. 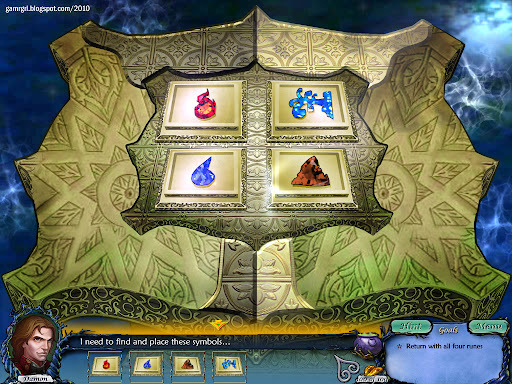 Take the four runes released by the clock. Exit the clock. Return to the aviary. Click the pedestal in the aviary. 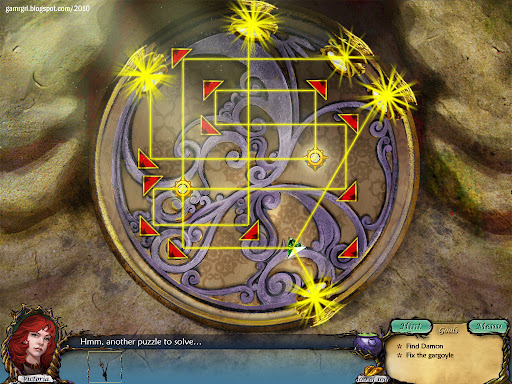 SOLUTION: Victoria has to place the 4 runes in the gargoyle tablet. Click a rune in the inventory, then click the correct slot from the silhouettes to place it on the tablet. Victoria has to open the final tower lock. Exit the aviary. Go to Celeste's chamber in the garden. Enter Damon's bedroom through the mirror. The final barrier blocking the potion is broken. Victoria has to find Damon and given him the potion. Exit the bedroom. Go to the ballroom. Victoria confronts Damon, but Celeste has him firmly under her control. 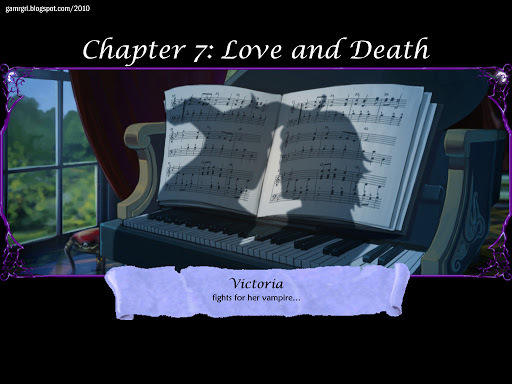 Victoria must complete Damon's sonata to prevent him from smashing the potion. SOLUTION: This is a sudoku-format puzzle. Each row and column must have 9 unique symbols and colours. Most of the symbols are already in place. Click a symbol from the stock at left, and click a square on the board to place it. A completed line get highlighted and locked into place. HINT: Start with column 1 from left, then column 6 from left, then row 2 from top and the bottom row. Victoria now has to play the piece on the piano. 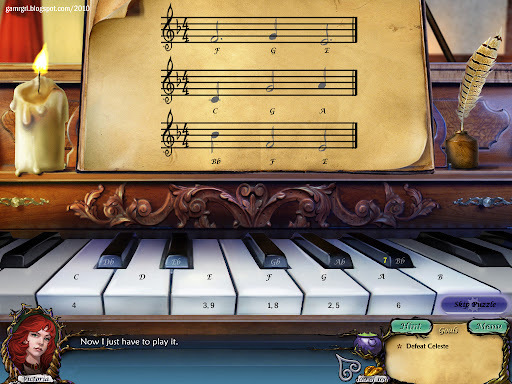 SOLUTION: The music sheet has alphabets matching the keys on the piano. Victoria has to press the correct eyes in order, left to right and top to bottom of the music sheet. 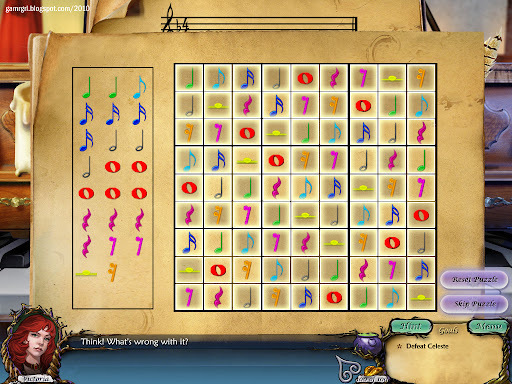 The music sheet gets highlighted as each note is played. 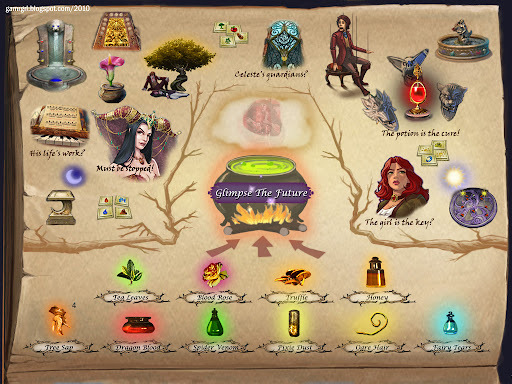 If you have collected a 100 leaves during the course of the game, on Odette's map, click the cauldron in the middle to Glimpse The Future. 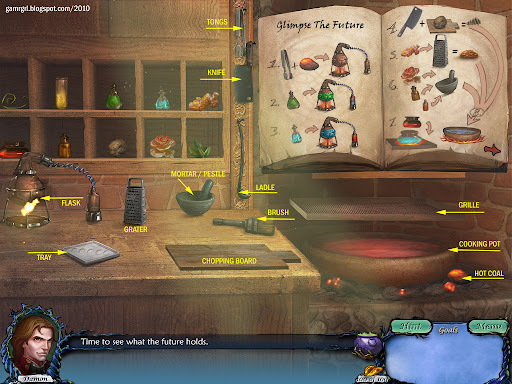 Damon has to put together the ingredients for a brew according to the recipe that reveals the future. Click the green bottle, top shelf, centre alcove. Click the blue bottle, top shelf, second alcove from right. Click the brown ingredient, bottom shelf, centre alcove. Click the ginger-like ingredient, top shelf, right-most alcove. Click the flower, bottom shelf, second alcove from right. Click the brown bottle, bottom shelf, second alcove from left. Click the small red flaskette on the counter, attached to the flask. Click the red bottle, bottom shelf, left-most alcove. Click the grille above the cooking pot. Click the chopped ingredient on the chopping board. Click the grated ingredient beside the grater. Click the mortal / pestle with the combined ingredients. Click the curled ingredient, top shelf, left-most alcove. Click the now-blue bottle on the grille. 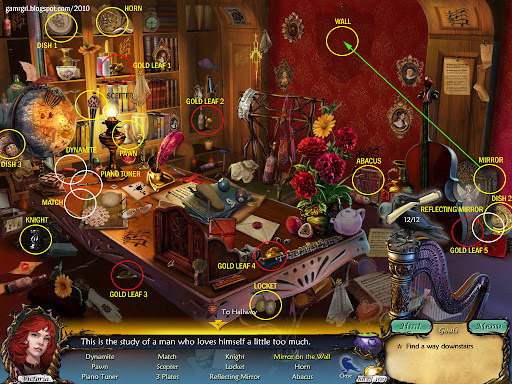 Click the yellow test-tube, top shelf, second alcove from left. Click the leaves, bottom shelf, right-most alcove. The tongs picks up a bunch of cooked leaves. Click the tray on the counter to place the leaves in it. Repeat 4 more times to fill the tray. Click the brush on the counter. The brush picks up the blue liquid. Click the leaves on the tray to use the brush on them. Repeat 4 more times to brush all the leaves. Get a glimpse of the future!